Using the Greek system of musical ethos as a model, the early Roman Catholic Church began to develop new rules for what music was acceptable during services. Music that did not adhere to the rules for 'sacred music' was then considered impure. 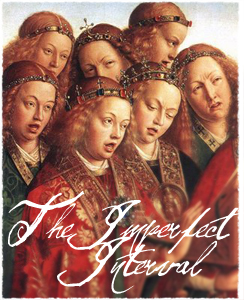 More specifically, some intervals were considered 'perfect' while others were 'imperfect.' Of all the intervals in an octave, the most impure and imperfect musical interval was the tritone that divides an octave. The tritone was considered not only an unfit and unpleasing interval by the Church fathers - it was believed to be an evil interval that could adversely affect our character when used in music. It was even referred to as Diabolus in Musica, or Devil in Music, and expressly forbidden under Church canon law. To this day the Church officially maintains a policy of tritone avoidance as set forth in the decree of 'universal liturgical music in Gregorian chant,' most recently reaffirmed in the 1903-1967 Musicam Sacram [Joncas 1997]. Because of this law, the tritone has remained off limits to church composers for many hundreds of years and prohibited from all forms of 'sacred' music. One specific form of church music - the Old French Canon - is perhaps the best example of this anti-tritone doctrine. Named after the Greek kanon for rule or law, a musical canon is a type of contrapuntal music involving imitation between two or more voices. Most would recognize it as a simple round, found in such children's songs as Frere Jacques or Row, Row, Row Your Boat. But it is much more than this. As the story goes, English troubadours, French jongleurs and German minnesingers would travel from town to town during the 11th century, playing instruments, singing and otherwise entertaining the villagers. As more than one singer would perform together, they would improvise and mimic one another in melody, thus creating a round. As rounds increased in popularity, the Church was compelled to incorporate them into its services. But this was not so simple. 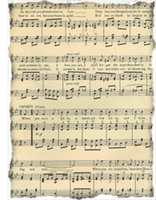 In order for musical rounds to be accepted into the Church, they had to be written in accordance with the canonical rules that prohibited use of the tritone (which occurred routinely during improvisation). Eliminating this possibility then required a much more scripted and rules-driven approach, transforming a simple round into the proper canon style. With Diabolus in Musica eliminated, the canonical round was then acceptable for church services. Speaking personally, I find more than a little irony in all this. First, the Church's canonical rules for music targeted the humblest of all songs - the playful rounds sung by innocent children and plain town folk as they imitated one another in song. Second, the Church had restricted the most natural form of musical expression possible, stealing away the pleasure and pure joy found in improvised harmonies. Third, with rounds firmly under the control of 'canon' law, they were given the name of the very ecclesiastical legal system itself! But the greatest irony is this. In spite of the Church's sacred act of musical purification - in the face of a disapproving clergy and fear of damnation - the cheerful round survived and remained quite popular in secular society. Children continued to sing them with great delight (just as they do today) while their parents clapped along, holding little concern for any mysterious side effect that might result from the Devil's interval. Now, the inevitable questions may begin. Why? Why would such an evil be thought to exist in music, much less this particular interval? What should be so horribly offensive in dividing an octave in half (as the tritone does) that it should be singled out and banned from all Western sacred music through an elaborate set of canonical rules? Was this effort purely based on religious symbolism or was there really something dangerous in the tritone that could hurt us? Could it negatively influence our hearts and minds, perhaps turning us toward evil? Many have speculated on this. Some say the tritone represents the Devil because it is a dissonant interval with an irreconcilable split ratio of 7:5 (augmented 4th) or 10:7 (diminished 5th) as found in meantone temperament. But dissonance cannot be the only reason. The tritone is not much (if any) more dissonant sounding than the intervals of a minor 2nd or major 7th and no one thinks they are devilish. They're not even naughty. Some say it was the Devil in music because the tritone is so close to the interval of a perfect 5th that two monks could too easily sing dissonantly as they tried to chant in pure parallel 5ths. But this cannot be the only reason because when they sang out of tune anywhere else, those wrong intervals weren't the Devil. They were just out of tune. While walking the streets of London some years back, Bob and I had discussed this subject and conjectured that the symmetric contraction of the tritone must have been taken as a symbol of symmetry in the human body and thereby sexuality and carnal knowledge. At the time, this was the only reason I could imagine for its exclusion from the Church and avoidance in music theory. There were no other psychological or physiological studies I knew that suggested the tritone was some kind of harmonic Viagra to enhance feelings of sexuality. But even if this were found to be the case, surely the procreative act should be considered a beautiful spiritual experience! Probably the most common reason given for the evil reputation of the tritone is its connection to the number '666,' the Number of the Beast referenced in the Biblical Book of Revelation. The importance of this number appears to have originated in the ancient Hebrew practice of gematria, or number geometry known today as numerology, where the tritone's 3 wholetones (the Devil's Trident perhaps) spanning 6 semitones could have suggested three consecutive sixes. A more likely gematria theory correlates to the number 216 as the ancient Hebrew symbol for God. It was believed that finding the missing code for this number would bring about the return of the Hebrew Satan in a final showdown, thus triggering a Messianic Age of peace. Not coincidentally, the cube root of 216 is six, or 6_6_6. Perhaps the missing code for the Hebrew Satan was once associated with the tritone. Similarly, when 6 tritones, each composed of 6 semitones, are stacked over 3 octaves it surrounds the pentagonal cycle of perfect 5ths with a triple hexagonal cycle of tritones, or 666. In the end, it seems to make little difference which theory we choose to accept because alignments with the old Beast of Christianity pops up everywhere we look. These sixes are neither coincidences nor silly mysterious numerological symbolisms, but are in fact numerical proportions related to the physics of highly resonant vibration (i.e., major sixth = 5:3 = 1.6666666}. Still, the speculation surrounding the tritone continues because nowhere in the mountains of religious or scientific literature will you find it taken seriously and explained as a natural property of acoustics. Yet even when we disregard religious and numeric symbolism there remains a real sensation of tension in the tritone and an anticipated tendency for it to automatically spring closed. We don't really need religious symbolisms and stories to see how the priests could have concluded that something demonic was involved. At a time of deep mysticism and belief in satanic forces, the tritone was probably seen as some kind of daemonic planchette, sliding along a musical Quija board under its own supernatural power. Far more than just a musical concept, the tritone offers us a window into the collective psyche, touching on our concept of God and belief in good and evil. Like an anthropological microscope equipped with a musical lens, the tritone allows us to see inside a society shaped by the Roman Catholic Church. Indeed, it brings into focus a world still largely under the influence of its anti-pagan, anti-harmonic doctrine. Cast as an evil force and anti-Christ figure in the Underworld of music, the tritone is still avoided in many ways. With a history of embarrassment and ill repute, the tritone remains little discussed in academic settings for fear of offending the faithful. Textbooks simply refuse to discuss the history of the tritone, much less suggest it as a central tenet of music harmony. And never will you see the pentagram or golden ratio explained as having any functional role in music, these also being related to Pythagorean harmonic science. Instead, music theory and composition continue to be taught historically based on religious tradition, amended as needed by an ever-growing number of exceptions to the rules. If we ever hope to solve the mystery of music harmony and our perception of it, we must question these outdated conventions against all criticism. We must stand in that dreadful position at the center of the octave schisma, where harmony seems most irreconcilable, and try to understand the tritone. We simply must force ourselves to explain what it means to mend a warped pentagram into a closed circle using the Tritone Function. And in spite of the many skeptics and scientific debunkers who see the golden ratio as having nothing to do with music, we must objectively explore what physical role it could actually play in sound and perception. We need to ask what is it about the tritone that is restless or has a spring-like tendency to move. Is it in our head or out there in the air somewhere? Who made these rules and, more importantly, why were they broken? Was it a good thing or a bad thing that the tritone was forbidden by the Church? And how might the avoidance of the tritone have impacted our present theories and educational doctrine concerning music and the natural sciences?